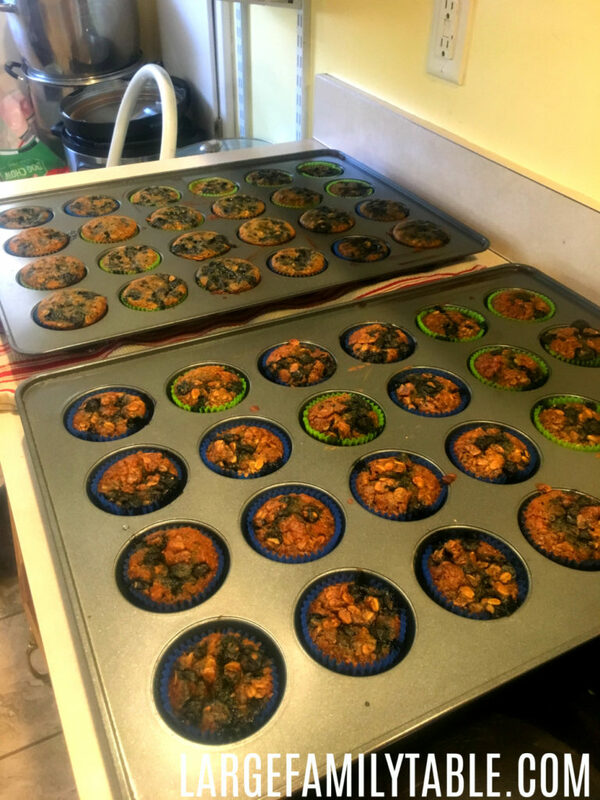 During week three of my recent large family pantry and freezer challenge, I did some big-batch cooking and did 4 dozen oatmeal blueberry muffins! Some oatmeal muffin ingredients I was out of such as All-Spice or Cinnamon. For the most part, I had everything needed to do some big-batch cooking of oatmeal blueberry muffins. 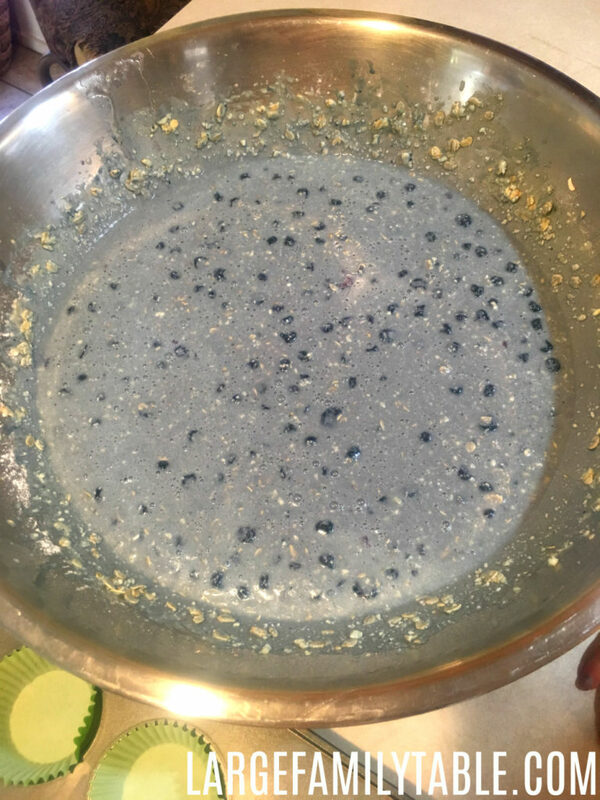 I had lots of bulk oatmeal in the pantry and a full bag of frozen blueberries in the freezer. We were also out of sugar and additionally, we didn’t have Stevia (I like to bake with Stevia when possible). Because of this, I used honey since I actually had an unopened bottle in the pantry – yay! The kids love batch cooking and helping me make up tons of various muffins, many freezer fruit breads, bulk cooking pizza dough, or whatever strikes our cooking inspiration! Batch cooking allows me to cook up a bunch of whatever item using some for now and freezing or storing the rest for later meals. 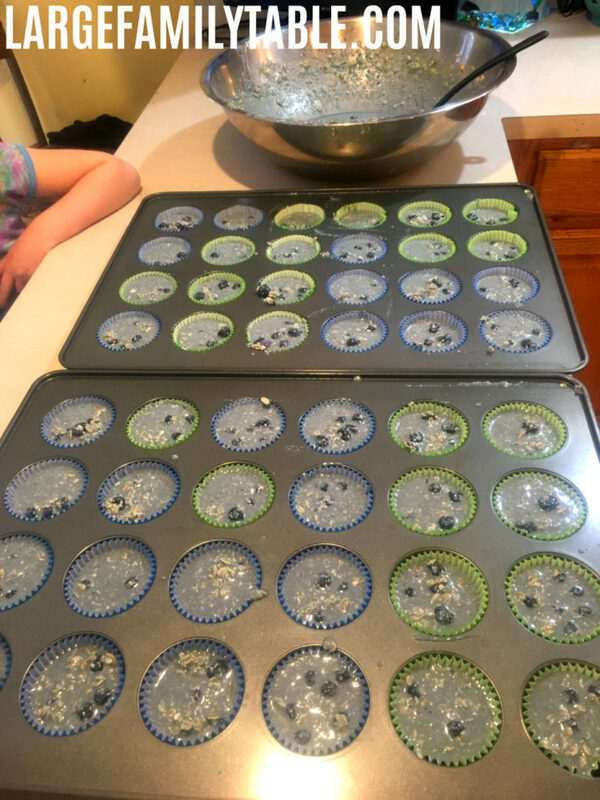 On our batch cooking day for all these oatmeal blueberry muffins, Daniel and Amelia both had turns with the mixer. I was a little crunched for time (says the momma who decides to suddenly make 4 dozen muffins during breakfast, ha! ), so I poured the batter into the muffin cups without helpers this time. Here are more of my batch cooking recipes you might enjoy making for your family. You can even use batch cooking ideas such as bulk meal prepping grilled cheese sandwiches, peanut butter and jelly sandwiches, and tons of breakfast meals! Feel free to change up the fruit with this bulk cooking recipe. If you don’t have blueberries in your freezer you can use cranberries, raisins, bananas, or other fruits! I used what I had during this bulk cooking time, which was a bunch of frozen blueberries from my freezer. Next up though, I have a few gallons of frozen bananas that need to find to purpose in life! Your family will enjoy these batch cooking oatmeal blueberry muffins! make 4 dozen at a time to have some to freeze for later. Mix all dry ingredients in one bowl and mix all wet ingredients in another bowl. Next combined wet and dry ingredients and mix together well. Fill muffins cups with liners and fill each cup 3/4 full. Preheat oven to 375 and bake oatmeal blueberry muffins for 25 minutes. I make 48 oatmeal blueberry muffins at one time. Since I have a small oven I have to put my 2nd pan that was on my bottom rack unto the top rack for 5 additional minutes. After muffins have cooled you can store additional muffins in a labeled gallon freezer bag. When you need to serve your muffins just place into the refrigerator the night before to defrost. Serve in the morning and warm in the microwave if desired. 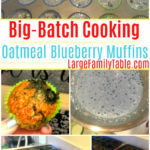 I hope you enjoy big batch cooking this bulk batch of oatmeal blueberry muffins! 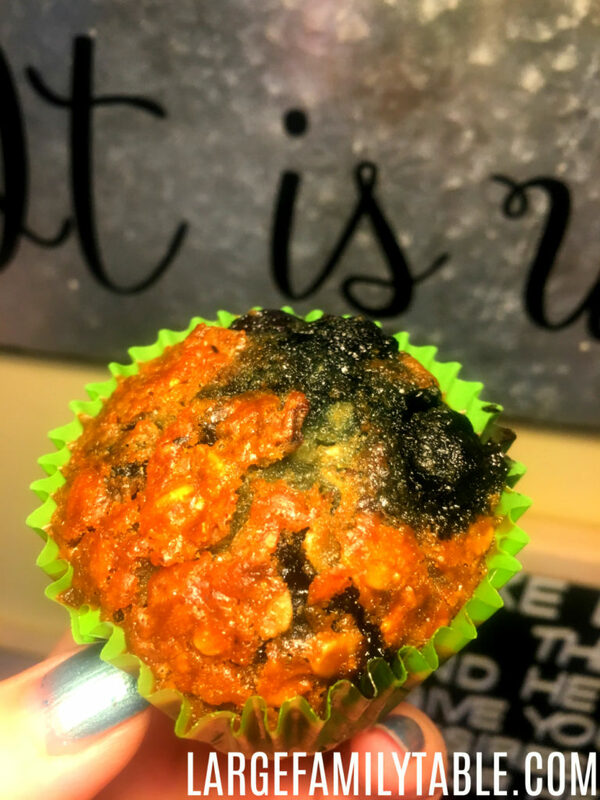 If you’d like to see me batch cooking these muffins in action click here to watch my Pantry and Freezer Challenge Week Two video for more of the muffin making fun. 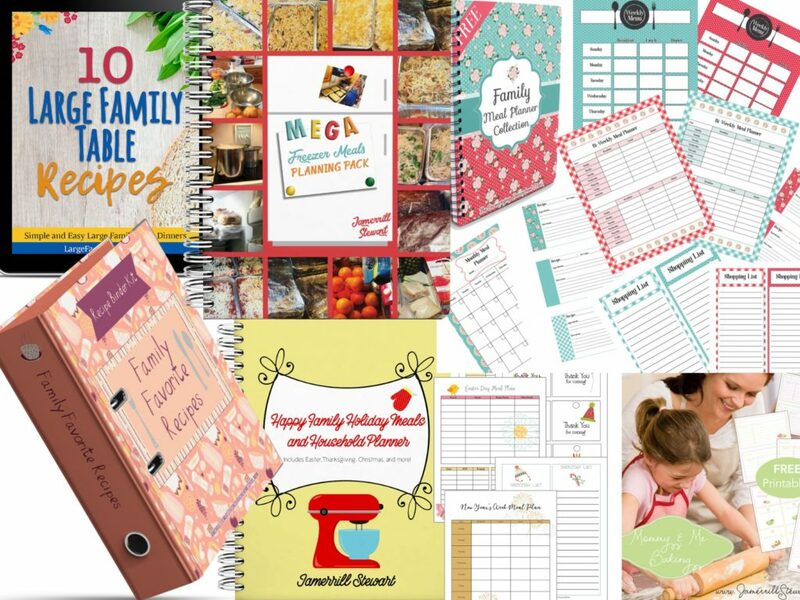 Would you like a TON of free meal planners, grocery lists, recipe cards, freezer meal planning pages, large family dinner cook book and more? 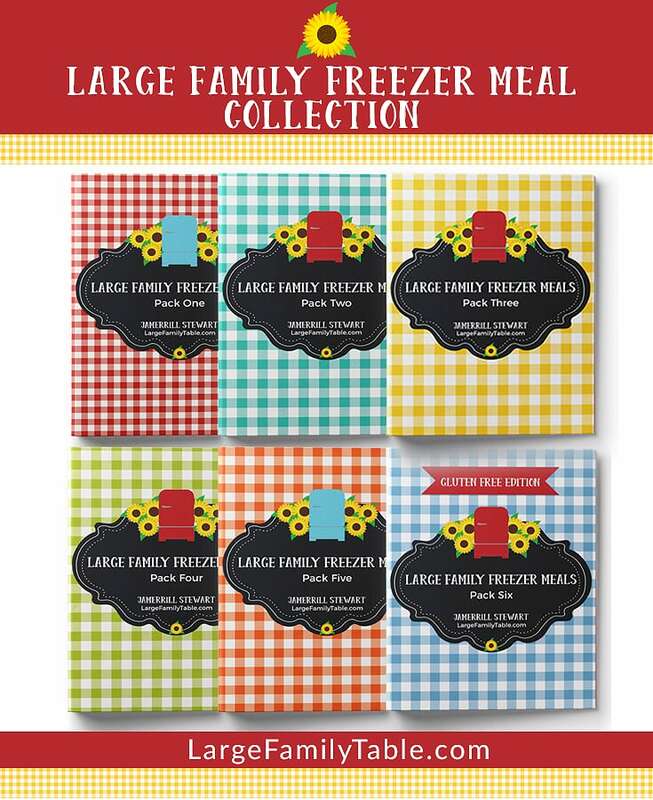 No problem, just grab your free Large Family Food Collection here! !